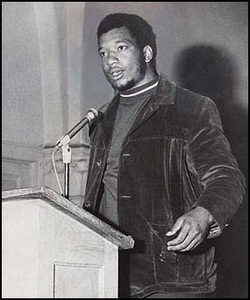 Fred Hampton was born on August 30, 1948 in Chicago, Illinois. Fred was both very intellectual and an athletic student all around. He graduated from Proviso East High School in 1966 and went to Trinton Junior College. Fred studied law at Trinton East College so he could better familiarize himself with the law using it as defense from the law later on. Fred was active in the Civil Rights Movement while in school. He joined the NAACP (National Association for the Advancement of Colored People) where he quickly became the leader. Later on as the Black Panther Party was formed by Huey P. Newton and Bobby Seale in Oakland, California and it was gaining national attention, Fred liked what they were doing and joined them. He soon relocated back to Chicago and joined the Chicago’s Black Panther chapter. Over the course of the next year, Fred quickly had made many changes to Chicago’s African-Americans lives. When Fred joined the Chicago chapter of the Black Panther Party with Bob Brown, he quickly established a community service program. This program included free breakfasts for school children and medical clinics that were free. He had taught political education classes every morning at 6am and made a project for the community to keep supervision of the police. Fred organized weekly rallies and gave many speeches. As his skills and charisma were portrayed early on he was soon the leader of the Chicago chapter of the Black Panthers. If not for his death, Fred Hampton was going to achieve the position of the Party’s Central Committee’s Chief of Staff. One of Fred’s greatest achievements was that he persuaded Chicago’s most powerful street gangs to stop fighting against each other. Fred told them that all the fighting and racial and ethnic conflicts would only lead into the member’s everlasting poverty. On May 1969, Hampton called a press conference declaring a nonaggression pact between the gangs and the “rainbow coalition”. The rainbow coalition was a multiracial alliance of African-Americans, Puerto Ricans, and the poor youths. Soon after the Black Panther Party was becoming nationally known and achieving many things the Panthers were getting the attention of the FBI. FBI chief John E. Hoover said that the Panthers were “the greatest threat to the internal security of the country”. Hoover urged the police to raid the Panthers headquarters and the police did, three times, arresting over 100 members. The fourth time the police raided they supposedly said that the Panthers opened fire on them and ended up killing Fred Hampton and another Panther, Mark Clark. Hampton’s girlfriend who was pregnant at the time was arrested and charged with attempting to murder the police. Later on ballistic evidence showed that the Panthers had only got off on one shot and the police had fired nearly one hundred. “You can kill a revolutionary, but you can’t kill the revolution”. One of the most recognized quotes from Fred Hampton. There was much controversy after his death. Over 5,000 people attended his funeral in Chicago. He died at the age of 21. Imagine if he were alive for a couple more years, all the change and prosperity he would have brought to the Blacks lives. Hampton is very popular in rap music now-a-days getting mentioned by rappers like Jay-Z, Kendrick Lamar, Tyler the Creator, and Hodgy Beats. Jay-Z mentioned Fred on his song Murder To Excellence, saying, “I was born on the day Fred Hampton died”. This is true, Jay-Z was born the day Hampton was murdered. Fred is also mentioned on Hodgy Beats’ song Loco. Hodgy raps, “Pigs raid my crib I’m feelin’ like Fred Hampton, I got firearms under my mattress, campin’’. Hampton is recognized now, in 2012, and will forever be a true legend.